Vedio camera & camera fee. Gotipua Dance at Raghurajpur will attract additional cost. After breakfast proceed for Mangalajodi Wet land, The villagers of Mangalajodi will welcome you into their village; on the banks of the Chilika Lake, hosts more than 800000 birds which jostle in its marshy water, especially in winters. Two hours boat safari on wetland is a lifetime experience for the visitors, where local & migratory birds can be seen in few meters only. Visitors will be accommodated by village bird guide; they have immense knowledge of this ecology. Once upon a time these villagers were poachers but now they become the protectors of bird. It’s a beautiful journey of life, visit Mangalazodi to get complete picture with fast hand experience of Sustainable ecology & human connections. 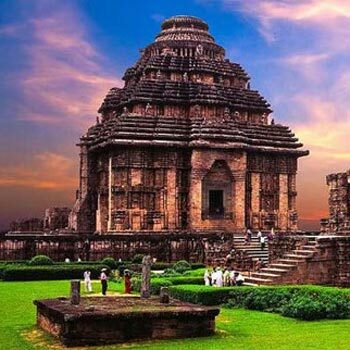 After breakfast drive to Puri, enroute visit Dhauli (Buddhist Santi Stupa), Pipili (Appliqué work village) local market & Konark Sun Temple, have lunch Konark and then visit Chandrabhaga Sea Beach. Morning Darshan Lord Jangannath and after breakfast move to Chilika Lake, Asia’s largest estuarine water lagoon covers an area of 1100 sq Km with combination of salt and fresh water. The lake is separated from the Bay of Bengal by a narrow sandy ridge, called Ramsar Wetland. For it biodiversity, this lake attracts millions migratory bird in winter. It also home to a diverse range of aquatic life, including 225 species of fish and the playful Irrawaddy Dolphin. Boating to Mouth Of Chilika Lake: the point where see meets the lake. Then visit Raghurajpur (Painting village), the main village has two streets with over 120 houses, most decorated with mural paintings, where the painters reside and practice their Pattachitra craft, besides many others that practices throughout the village, including traditional masks, stone idols, paper Mache, sculptures, and wooden toys. And also you can witness Gotipua dance, is a traditional dance form in the state of Odisha, India, and the precursor of Odissi classical dance. It has been performed in Odisha for centuries by young boys, who dress as young women to praise Jagannath and Krishna. The dance is executed by a group of boys who perform acrobatic figures inspired by the life of Radha and Krishna. And this performance is a life time experience for visitors.